The nice thing about being some what organized is it makes purging (and knowing when to purge) really easy. As I take you through my office you will see what I mean. As a general rule I am organized by color (under Stacy's direction) and by theme. Before taking on the design and function of my room I collected tear sheets of rooms from magazines and the internet. Not just pictures of craft rooms and offices, just of anything that caught my eye. I put these all in a folder and after about six to eight months I had a pretty good collection and also noticed that I would tear or print out similar STYLES, COLORS, and accessories. Here is a link to my Flickr favorites to see where I got some of my inspiration. And these two blogs cannot be missed for ideas: Jeanette and Paula (another Paula!). From my project file I determined a couple of things. What is it going to look like? 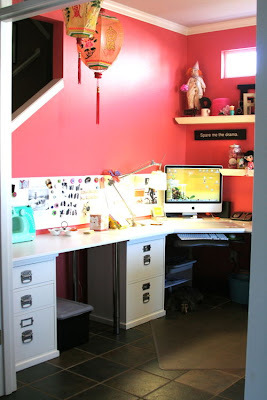 My main furniture would be white, wall color coral and my island/work table would be a dark color. Finding the perfect coral. One that isn't too pink or too red or too peachy. I settled on Curvaceous Coral by Anna Sova. Of course no one around here carries Anna Sova paint and I really didn't want to pay $59/gallon for it. So I had my local paint store find the recipe and they whipped it up in a day for WAY less! I chose this color because I wanted something bright for the gloomy days of the NW and when it was sunny I wanted to be reminded of fresh tropical warmth. 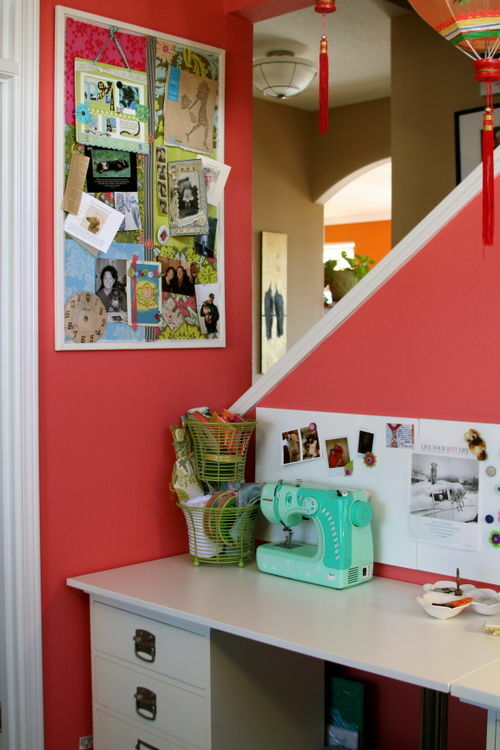 If you are looking to paint your space keep in mind how the color is going to make you feel - choose your happy color. If your happy color happens to be on the bright side maybe go up or down on the paint swatch. (Selby is always found sleeping under my desk) This has already been rearranged from the first time I moved into this space. The furniture is a mix of Pottery Barn and Ikea. The Ikea piece is explained here. I also put up some of the Ikea Bits magnetic boards. This was hard! Be sure to choose boards that are not bent. It will make your life so much easier when trying to hang these. The laser line tool will be your best friend when doing this. I spend most of my time in front of the computer and the secondary work space is used by Sara or Maddie when they are here and it also doubles as my sewing and jewelry making area. 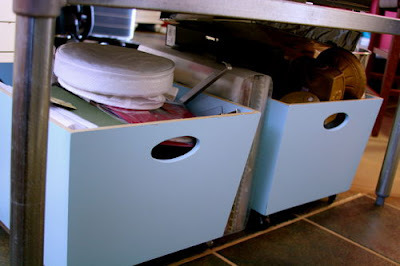 The far left drawers hold patterns and supply catalogs for those functions. This area has my inspiration board, my Hello Kitty sewing machine that I use for paper and odd sewing. I bought this on ebay for half the price! 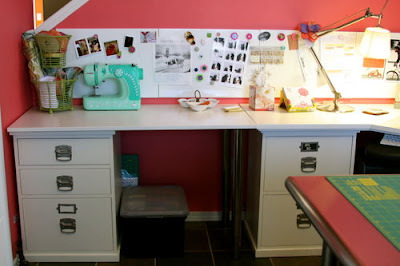 You can see that I store my cutting mats and ironing boards behind this desk unit. The green two tiered basket I bought at an antique store but I think it's new. It is full of my latest thrift material finds. Here is my main work area. I use a iMac, which I LOVE and won't be going back to PC anytime soon. This is where I sit on my exercise ball for most of the day running all of my businesses. The desk lamp is from Target. On the magnet board closest to me I keep two inspiration pieces: 1) Patagonia ad with a dog on the back of a bike rider by Pascal Beauvais and 2) Curly Girl card and magnet, and also the current yoga class schedule. Underneath my desk is a large format printer (that will be going bye bye pretty soon) and a metal bucket that is full of business magazines that I need to go through. Now let me tell you about my experience with the PB office furniture. Overall I am happy with the style, what I am not happy about is the durability. I have other PB furniture in my house and I am thrilled with durability. But this office furniture cannot withstand more than one person use. Meaning if you have kids or other family members that will use this area, it's going to get dinged up fast. It scuffs very easily and the only thing that I have found that removes it, is Undo wipes! I have black scuff marks everywhere and I have tried everything. Nothing removes it except the undo wipes. I think the wipes were discontinued so I use them sparingly. I did not order the pexi glass top because I just couldn't afford another piece. But I plan on having one cut by a local shop for about a 1/3 of the price. Now to my crafting work space! 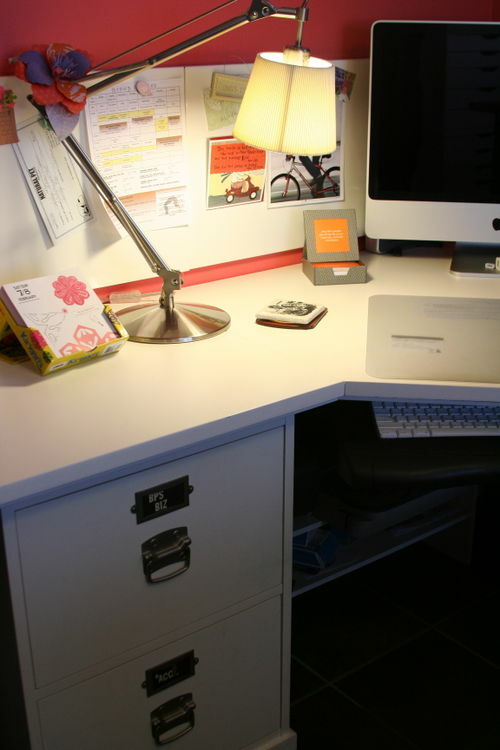 When I ordered the PB desk furniture I also ordered the Bedford Project Table in black. I am not sure why I thought it was going to fit in my space but it was way too big and again the quality was lacking. The back side of the shelves were not painted all the way and while installing the top it already had chips in the paint. This piece went back immediately and PB was very gracious to take it back no questions asked. On the way home from returning it Kirk said that we should stop by and look at some stainless steel work tables at a restaurant supply place. I fell in love with the functionality and most of all the PRICE, only $235. My table is consider an economy work table with a stainless steel top and galvanized lower shelf. Dimensions are 30"x48". The stainless steel adds a different look to the room and isn't bulky. Plus, I can heat on it, drip, scratch and it all cleans up very easily. 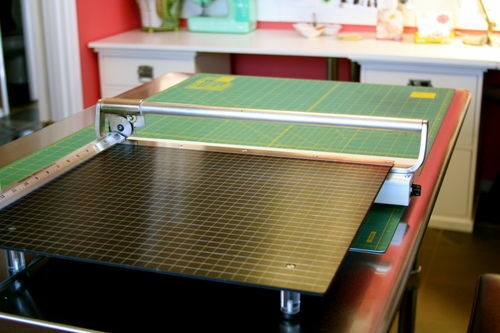 On top of my work area I have a XL cutting mat that I found at JoAnn's, my Genesis trimmer 16", and PB lazy susan. The Genesis trimmer is worth every penny, unfortunately they are not taking any new orders at this time and I have no idea when they will. I have had mine since 2004 and it was the BEST Valentine's Day gift! Most people would be fine with the 12", but if you use any large format paper the 16" is a good size. 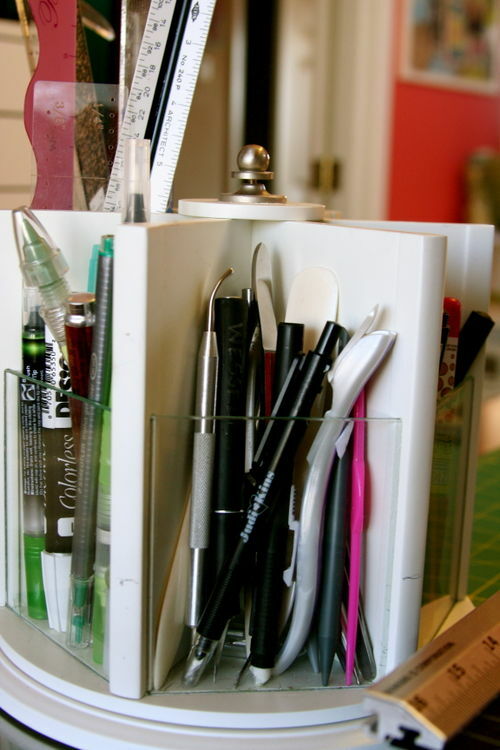 My PB lazy susan holds all the tools that I need at hand: all types of journaling pens, pencils, pokers, folders, knives, and rulers. I used to have the larger one like this, but it took up way too much room. I actually saw a similar lazy susan to the one I have at TJ Maxx the other day, in red. TJ Maxx is a great source for unique organizational items. You need time to sort through the stuff, but you can find some good deals there. I decided to organize them this way because that is the way I create. 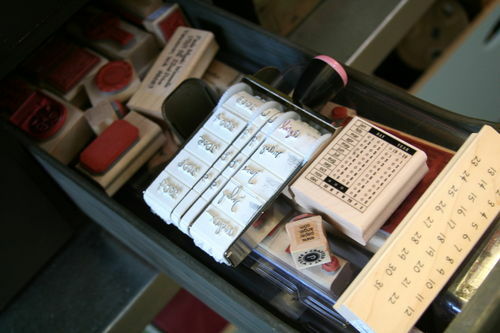 If I am doing Thank you cards I want to go to one area to find all of my Thank You stamps. If I am doing a Love layout and want some Love words - I know where to go very easily. By doing it this way it means that I have had to separate 'sets'. 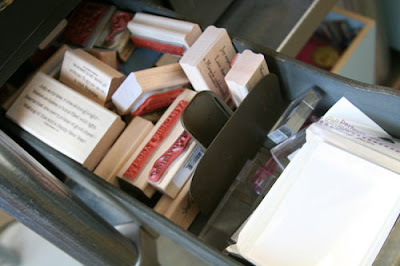 I buy a lot of Stampin Up stamps and I separate most of them. Storing them in those plastic boxes took up too much room - I was trying to accomodate them instead of making them work within MY organization. Plus I gave away or sold the stamps in the set that I was never going to use. When I am out shopping/thrifting I look for small bowls or boxes that I can store small items in. Above you can see a blue bowl I found at Goodwill for 25 cents. 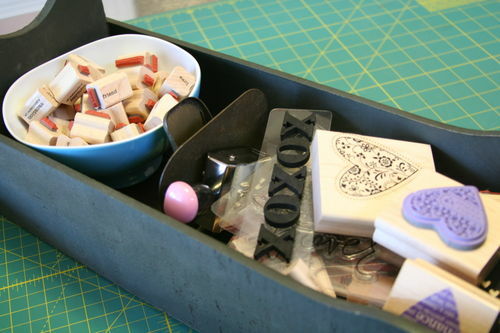 It works perfect for these tiny stamps and fits in the drawer! [HINT] Once these areas get full - that means I need to 1) stop buying, I can see by my drawers that I really don't need another Thank you stamp. Or 2) purge. You can see how purging becomes a simple task...when things start to over flow something needs to give. And with stamps it is easy to tell what you have used and what still has never seen an ink pad! If it doesn't have ink on it - it probably isn't ever going to, so give it away or sell it on Ebay. This is my stamping tool tote. Again found this at a garage sale for $1. 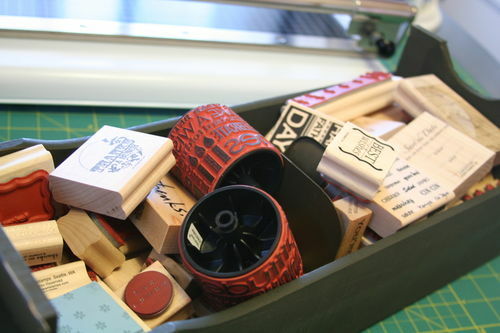 It holds all my frequently used stamp pads: VersaFine, StazOn, VersaMark, the newest SU colors, Kaliedascope ink, Stampin around tool, Distress ink, and distress ink sprays. 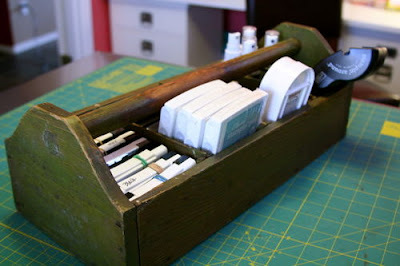 This sits perfectly in between my word stamp drawers and my LOM category drawers. I won't go into detail about these category drawers since they are class related and it would take a whole post to talk about them! 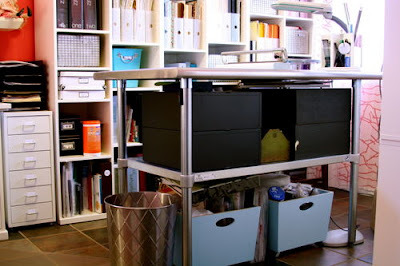 Underneath the work table are two bins that I bought at Target in the close out section and added some wheels. 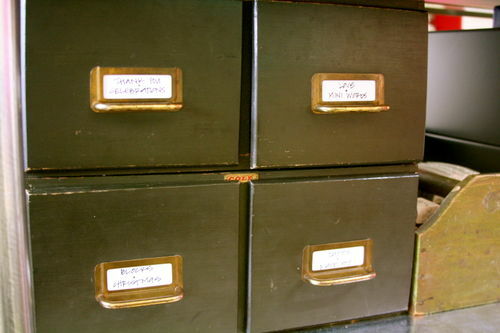 These bins contain projects in progress or projects to do. The rule of thumb is I can't start or buy a new project until I clear something out of these bins. This actually works! It's hard but it prevents over buying. Now if a project has been in there for more than a year I have to be really honest with myself and ask "Are you really going to do this, cause if you are, you better finish it today or give it away." The accordian holder in the middle of the bins holds all of my scrap patterned paper that is sorted by color. [HINT] I don't save every scrap of paper. It has to be at least 3" or 4", if I am going to take the time to file it away and actually find it again. Any smaller than that - it will get lost. I used to save the smallest scrap thinking that I would use it for punches...NEVER happened. If you made it through this far Thank you! 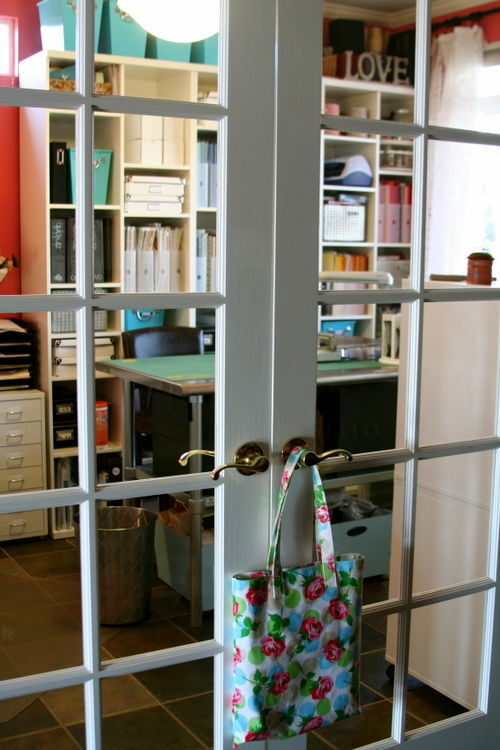 I hope this gave you some inspiration to get started on your organizing journey. This isn't done overnight, so be sure to take your time to really think about what you want to do in your area and how you work within your room. If you have any questions let me know! Stay tuned for part two tomorrow. I hope all my Australian friends are okay - I have been watching the world news and the fires over there look awful!